Like many other 3D printer owners, I’ve long dreamed of processing post-consumer plastic into new filament for printing. I’ve now taken a couple of steps in that direction. Friday evening I left off with the extruder working again. Saturday I focused on the heated build platform. I’ve always had astoundingly good luck with kapton tape since nophead’s serendipitous discovery, probably because I (still) prefer to print in ABS. When the build platform is warm, my prints stick to it absolutely with no raft or mouse ears and once it has cooled, they release easily. That’s a pretty compelling combination. So my first step was replacing the scraped-up kapton that I gouged the last time the printer was on. I bought a 4″ roll way back when and I keep a strip of unsticky tucked under the end so I don’t have to peel it up with fingernails and get fingerprints on the stickum. In the past I’ve always replaced the tape by sticking down the end and using a credit card to “squeegee” it onto the surface, and it can be tough to avoid getting bubbles. Yesterday I unrolled enough tape to cover the platform and when I had it stretched out, it was easy to align the front edge of the tape with the front edge of the platform, at which point I squeegeed it down with my thumb with no bubbles at all. Huh, well, I guess I’ll remember that. The next step in running the CupCake 3D printer is reinstalling the software and connecting to the machine. It went surprisingly well, with the only real snag being my misremembering the installation process, leaving me stuck in NotConnectedLand for a while. A lot has happened in the world of hobbyist 3D printing since the last time I had the CupCake powered up and both new firmware and new driver software are available. I’m interested in upgrading both as I have time; but for a first boot, I want to change as few variables as possible. That means leaving the firmware that’s on the CupCake and matching a legacy version of ReplicatorG to what’s on it. And I had no idea what was on it. Fortunately I have a blog and on that blog I write some things. So there you have it: I need ReplicatorG version 0026 to connect to the 3.0 firmware currently on my CupCake. Happily, the ReplicatorG web site is still online in spite of MakerBot’s acquisition by Stratasys (though I note there have been no code updates since the acquisition). The download page has dowload links for only the last version (0040) but also has links to the Google Code archive, which on p3 has that 0026 for the Mac that I’m looking for. and had to look up to right-click and Open rather than double-click and change security preferences. After much playing around yesterday, I see that OS X Sierra does not remember approval I’ve given to run software on a disk image but does remember approval I’ve given to run software once it’s installed. Shockingly, clicking More Info... in that dialog does something useful — it takes me to Apple’s JRE download page for that version. After regaining consciousness, I installed that software and ReplicatorG starts up like a champ. I don’t find much online about this. 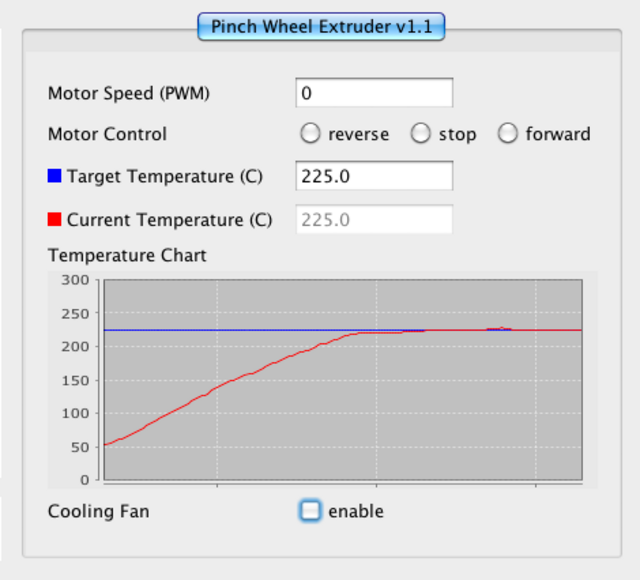 A Thingiverse Sailfish firmware comment sounds as though I simply have the wrong machine type selected, but I can’t even select a machine type. The tail end of a ReplicatorG comment thread sounds as though it can’t see USB-serial ports on current OS X versions, but it does see it. A much older MakerBot forum post mentions success after reseating the FTDI cable; but I don’t even know whether that’s the same issue and reseating mine didn’t help. It seemed obviously wrong that I couldn’t bring up the Machine Information… dialog, and I hunched that something was wrong there. Researching about the machine type, I saw that the ReplicatorG machine configuration page mentions a machines.xml file, which I didn’t have. But that sparked a memory — the ReplicatorG disk image had a machines folder in it and … oh, yeah. 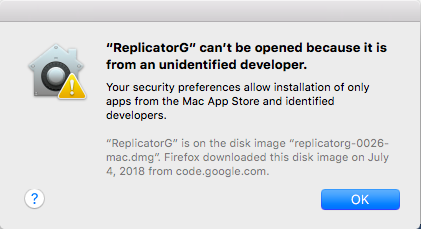 The ReplicatorG Mac installation page clearly says to create a ReplicatorG folder under Applications and drag the entire contents of the ReplicatorG disk image into it. Which I hadn’t. I’d just dragged the app because in spite of remembering and knowing better, I’d just dragged the app. I deleted the app from Applications, created the folder, dragged the contents, started ReplicatorG by right-clicking and choosing Open, and boom. Connected to the CupCake. I don’t have any of my CupCake’s calibration settings loaded in yet, in particular my thermistor coefficients, so this temperature is only an estimate; but it worked well enough. First squeeze! Software installed; connected to and controlling the machine. When first I ran the ReplicatorG software, I wondered whether I had the FTDI USB-Serial driver already loaded on my MacBook from working with Arduino or whether the driver was missing and was the cause of the problem. ReplicatorG did find a USB-Serial under the Serial Port list, but I still questioned. A bit of research shows that the driver’s presence or absence can be seen by running System Information and looking under Software / Installations. I didn’t see it there and I found that it can also be checked by running pkgutil --pkgs | grep -i ftdi . Didn’t see it there either. The FTDI driver version supplied with ReplicatorG was of course quite old and I didn’t know how well it’d work on a newer OS X release. I went to FTDI’s Virtual Com Port (VCP) driver page, downloaded and installed version 2.4.2, and found that it made no changes to what I was experiencing. I’m wondering whether the FTDI driver is by now supplied as part of OS X or whether it silently installed when I installed the Arduino software on this MacBook. 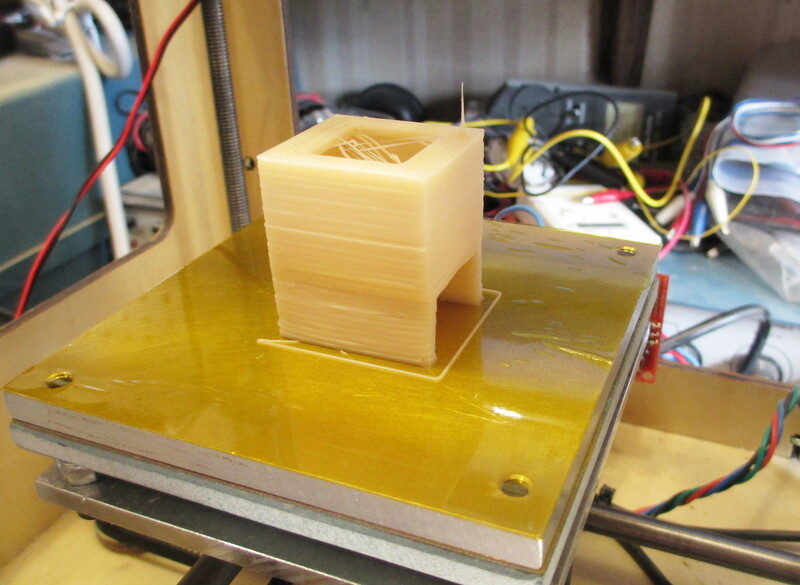 I devoted Wednesday, my Independence Day holiday, to getting my CupCake 3D printer running again. Foreshadowing: It turned out as a pessimist might suspect rather than as an optimist might plan. After making the filament de-duster five years ago about which I posted recently, I was finally getting consistent, reliable, beautiful 3D prints for the first time ever. For a month. The second try, I ran another print of the same model; the third try, I made a tiny dimensional change to the model or Skeinforge settings in case the extruder controller was glitching on some particular G code; but that doesn’t seem to have been the case. I got different bad behaviors and it seemed as though the extruder controller stopped taking instructions and kept doing exactly what it was doing at that moment. I don’t know whether it’s a firmware bug, a power supply problem, a wiring problem, an extruder board problem, or something I haven’t thought of yet. 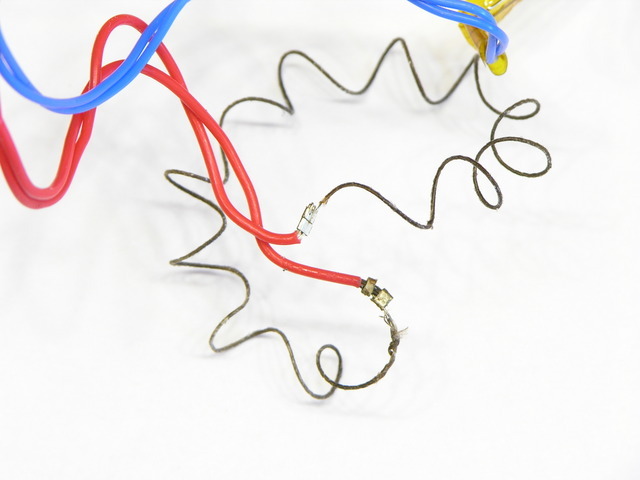 I have (recently) found reference to a few of the DC extruder motor windings shorting, reducing the coil resistance and increasing the load, to the point that the extruder controller FETs burn out. But these weren’t burned out — they worked again immediately (for another 40 minutes). And then before I could muster the motivation to troubleshoot it, both my laptop SSD and my workstation motherboard crashed, leaving me no working computer with 3D-printing software installed and no working computer with my CupCake’s calibration settings on it. And then time passed; OSes were upgraded; ReplicatorG versions increased; the barrier to reentry increased substantially; and I simply have not touched it since early 2014. I’ve just found this post I had started drafting in December 2013 and hadn’t finished. The remarks about reliability and long periods of disuse are still pertinent — this was one month before the last time I attempted to use it — as is the dust solution. In the four and a half years I’ve owned my MakerBot CupCake 3D printer, I’ve never had it working well enough to use for more than a week or two at a time. My real frustration has been a lack of understanding what has failed and how to fix it, so much so that it’s been almost two years since I most recently gave up and put it away. [Written in December 2013, and I haven't used it since January 2014.] I know there are newer, more reliable printers on the market; but it sure seems like it should be possible to get the CupCake to work reliably, if I’m willing to upgrade critical parts. In the intervening time [meaning 2011 to 2013], my friend Joel has run some prints for me on his Thing-O-Matic. Recently while chatting over a print in progress and checking whether the filament was jammed (solution: his build platform’s aluminum heat spreader was bolted tightly around all the edges, expanding when hot, bulging up in the middle progressively over an afternoon of attempted printing, and blocking the nozzle which was enough to jam things up), he mentioned that his nozzle had jammed to the point that he couldn’t even push filament through by hand with pliers (yes, my problem exactly) and that he had solved it (oh???). Joel had disassembled his extruder and lightly drilled most of the filament out of his clogged nozzle with an undersized bit, as I had in the past; then soaked out the rest of the plastic with acetone, as I had also. 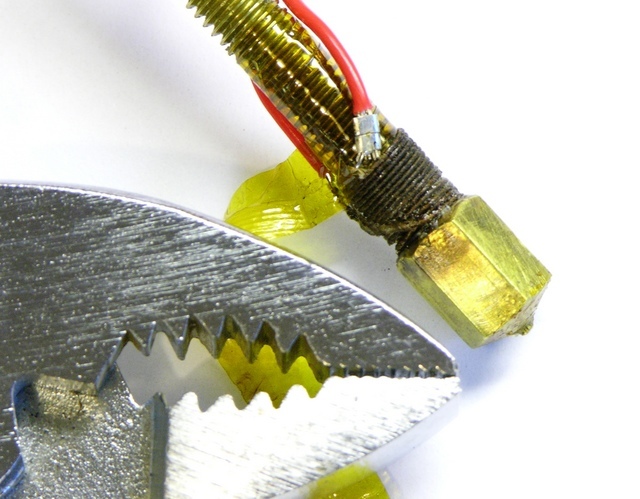 But when removing the clogged filament, Joel noticed it was quite dirty and made the mental connection with dust on the filament. 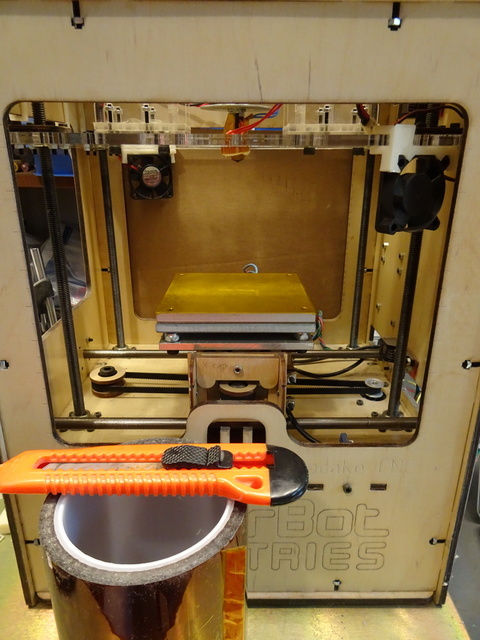 When he reassembled, he added a toothbrush to wipe dust off the filament on its way in and has also made a point to keep his supply bagged and/or boxed. Since then (and until the expanding heat spreader), he’s had no further troubles with clogging. This is not a new issue, but I had never heard anyone indicate it had so completely jammed their nozzles that their extruder wouldn’t extrude. And it fixed my CupCake. Mostly. For a while. After some success back in June using fans to cool extruded layers on my CupCake — in fact, right after that success — it slowed extruding and eventually stopped extruding altogether. This is the story of my life with the CupCake — a very brief success from time to time, but never persistent nor replicable. When I say stopped extruding, I mean the motor actually ground to a halt. Usually it chews a divot into the filament, but this time it stopped. And I was pretty sure — don’t remember whether I actually checked the on-screen display or not — that the nozzle temperature had dropped and the filament wasn’t melting any more. I know people talk about extruding ABS at temperatures as low as 200°C, and I don’t find that to be the case in my CupCake. Mine is calibrated, and mine doesn’t like temperatures that it thinks are lower than 220°C, and mine doesn’t really like temperatures that it thinks are below 225°C. So it really doesn’t take much to make it unhappy. 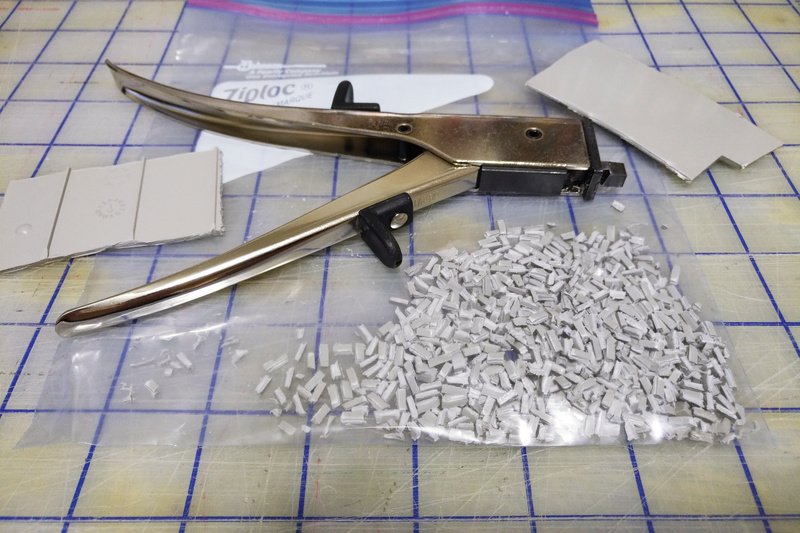 I had just rebuilt and rewound my heater at the time, and I knew that I had crimped the nichrome to the teflon-coated lead wires with silver crimp beads. I had a suspicion that the joints had become oxidized under the crimps, and the 7.3Ω resistance across my heater wires seemed high for my CupCake. A couple of weeks ago I disassembled the heater and found that one of the two connections was indeed quite scorched and oxidized. After cutting away the crimp tubes, cleaning the end of the nichrome wire with fine sandpaper, cutting back the lead wire, and recrimping, I tinned both lead wires with solder. Solder doesn’t stick to nichrome; but being coated with solder, the joint (which already had a solid mechanical connection from crimping) should be much less prone to oxidation. After the rebuild, the heater measured 6.8Ω. Half an ohm difference doesn’t sound like that much until you’re trying to get to 225°C. 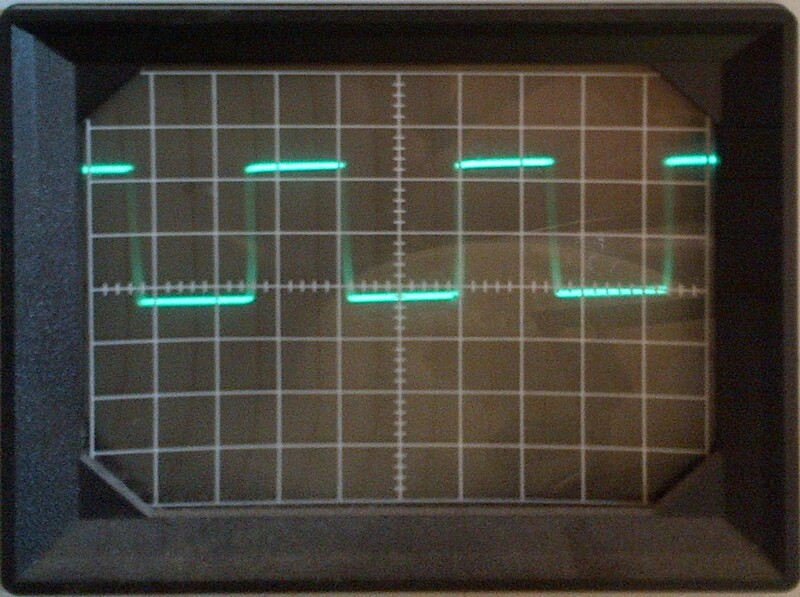 Since power P = V2 / R, at 7.3Ω, P = (12V)2 / 7.3Ω ≈ 19.7W; and at 6.8Ω, P = (12V)2 / 6.8Ω ≈ 21.2W; so maybe that could be enough to make the difference at the high end of the extruder’s temperature range. Aaaand … after reconnecting things, I still couldn’t get the temperature above 222-223°C, even though it now had some 7% more power. That doesn’t seem quite right. When in doubt, scope it out. 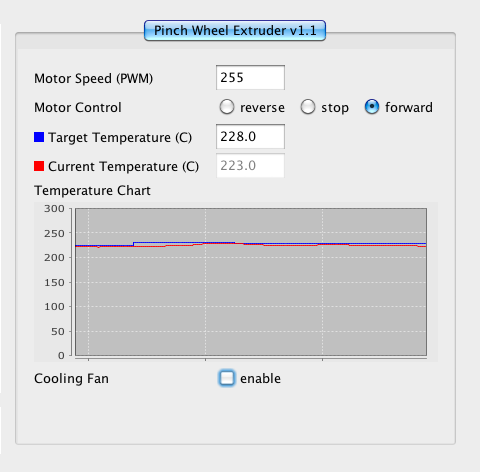 Yeah, after almost a full minute of failing to hold the temperature at the set point, the software PWM in the extruder controller was still running the heater at about a 50% duty cycle. That definitely doesn’t seem quite right. And isn’t something I can easily fix, either. The ReplicatorG version I was running didn’t have a control panel for the heater PID settings, so (even assuming I was smart enough to fiddle them into shape) I would have had to recompile the code each time I wanted to make a tweak, which wasn’t palatable. But I thought I’d heard that newer ReplicatorG versions did bring the PID coefficients into the machine control panel, so I upgraded ReplicatorG from 0024 to 0029r2, and let it upgrade my firmware from v2.4 (I think) to v3.0, and lo! lost communication between ReplicatorG and the CupCake. It said it had a connection but all the menu options to talk to the CupCake were greyed out. This is apparently a known problem claimed to have something to do with the Mac’s localization settings for the string representation of “,” and “.” in numbers. Srsly? And the suggested tweaks didn’t fix it for me, so I’ll just wait for the next ReplicatorG release. And since the Mac package of ReplicatorG continues to be a DMG file of all the pieces you have to drag into /Applications/ReplicatorG, rather than a ReplicatorG folder that one could conveniently drag into /Applications like everyone else provides … I guess I should feel lucky to have a Mac version at all, and I’m not holding my breath for a fix on this problem. Anyway, downgrading ReplicatorG to 0026 restored my connectivity and got me a look at those sweet, sweet PID coefficients. 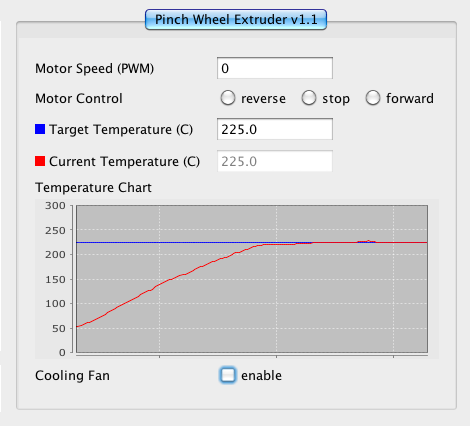 Which I no longer need, ’cause with the upgraded CupCake firmware, the PID algorithm seems to work right. Reaching for the knobs was obviously an attempt at a workaround, and the real fix is oh so much better. 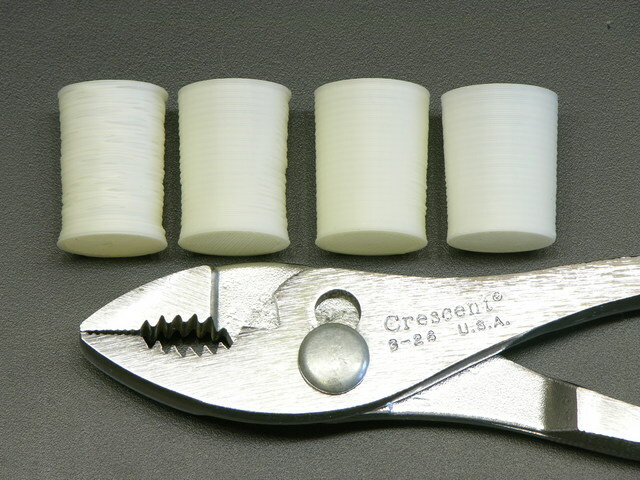 The stringing on this diffusing filter holder is my fault, not my machine’s — I have a 0° (or 90°) overhang on a concave curve, so there’s no way it was going to come out clean. I still wanted to see what it would do, and it performed admirably under the circumstances of an impossible model. And then stopped working again. 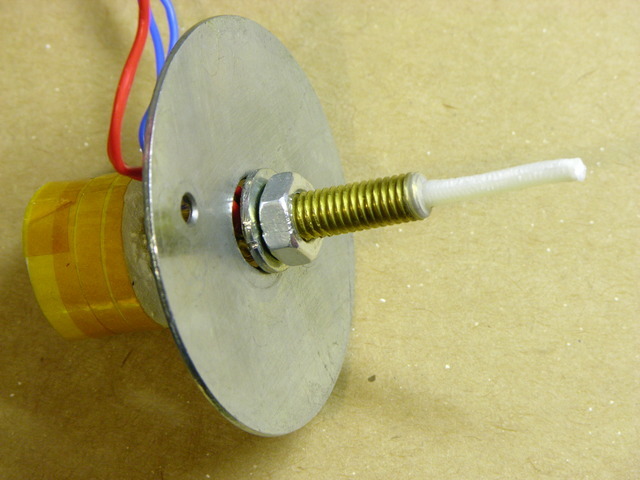 Filament drive motor locked up against the filament. A-gain. (Yay, great grip on the drive pulley, and nozzle retaining washer not breaking!) Temperature claims to be steady where set. My utility is fairly cold these days. I’ll try enclosing the build chamber again in hopes that although the nozzle is hot enough, the teflon tube is too cold — but I bet I end up disassembling and drilling out the inside of the tube and nozzle again. Should have been designed with a quick-release. While trying to print a replacement cap for a spray bottle (which I ultimately want to do in PLA, but that’s what broke my extruder and I’m working my way back up to it), sizing the cap properly for the bottle was complicated by the cap shrinking unevenly while the build was still in progress. I knew I needed to turn down the build platform temperature as soon as the first layer had adhered; but the cap was so thin that the platform didn’t lose heat fast enough to make much difference. I connected a spare DC fan to my bench power supply, set it just outside the CupCake’s build chamber, and dialed it down until it barely spun. Holy schmoly! The left cap (you’ll need to click the image for the larger version), made with no cooling, looks like an art project woven out of twigs; the next one is extremely smooth on the side that was facing the fan — better than anything I’ve printed before! The “seam” was on the side away from the fan and doesn’t look so as great as the fan side — but if one fan is good, two are surely better, right? The third and fourth prints above are with two fans running, trying to find optimal airspeed to cool the deposited filament but not cool the nozzle so much that the ABS solidifies before exiting. (I filed down the seam on the fourth; it didn’t really print quite that well.) I think the ultimate combination may be an enclosed build chamber to raise the overall temperature and fans to cool the layer just printed. 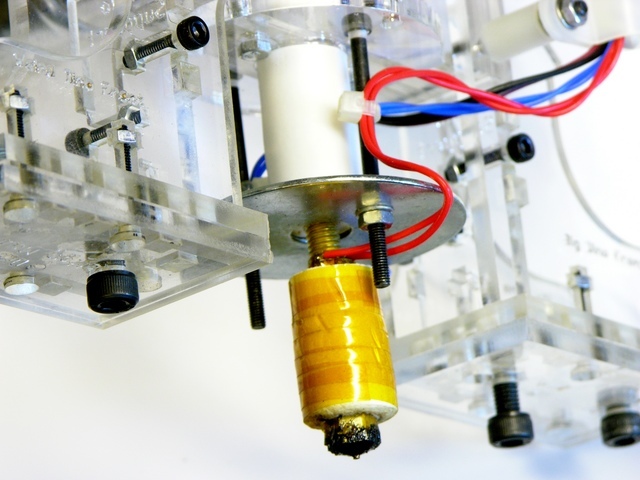 Many CupCake, RepRap, and Hydraraptor operators have added cooling fans, but I don’t recall seeing dramatic before-and-after pictures. Based on what I’ve observed during mesmerizing hours of watching the CupCake print, it’s obvious why it helps — without active cooling, the previous layer is still molten enough that the soft extrusion being deposited by the nozzle still applies enough force to squish the previous layer out of the way in some random direction. It may have been deposited in the right place, but it’s not in the right place any more after the next layer moves it. With cooling, it stays put. 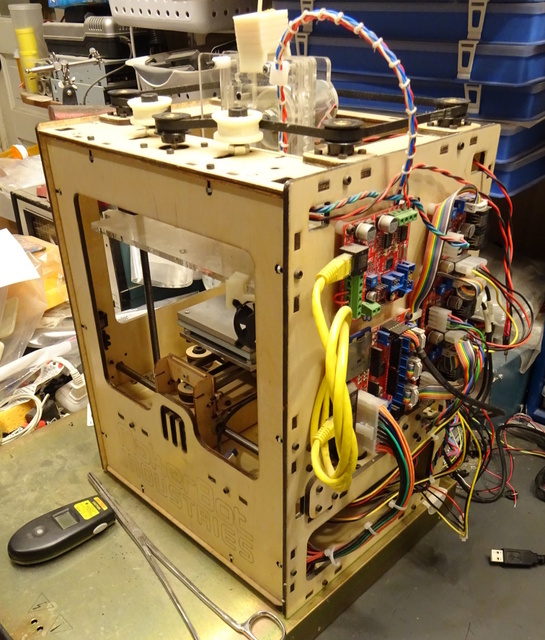 The CupCake carries the extruder up and down on a platform supported by four threaded rods. It’s a very economical design, but the rods are less precisely straight than Acme threaded rod and aren’t a perfect fit for the ID of the pulleys at the top. 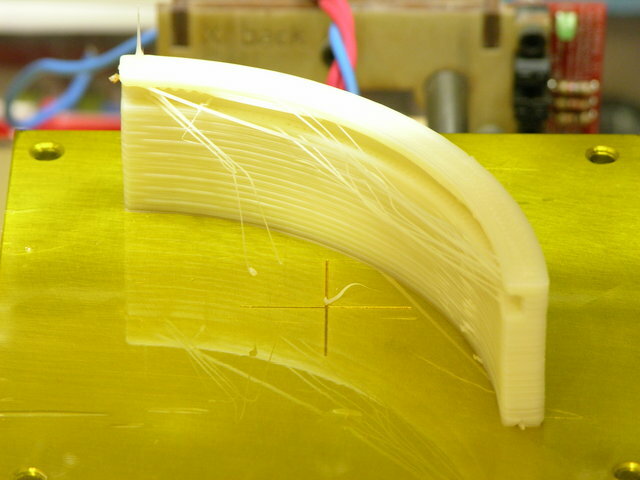 The combination of these factors results in the extruder platform swaying from side to side as it moves up and down. The effect is very visible during high-speed movement but still present during low-speed movement. My printed objects are finally at a high-enough quality that I can see the Z-axis wobble represented in the perimeter of the object. 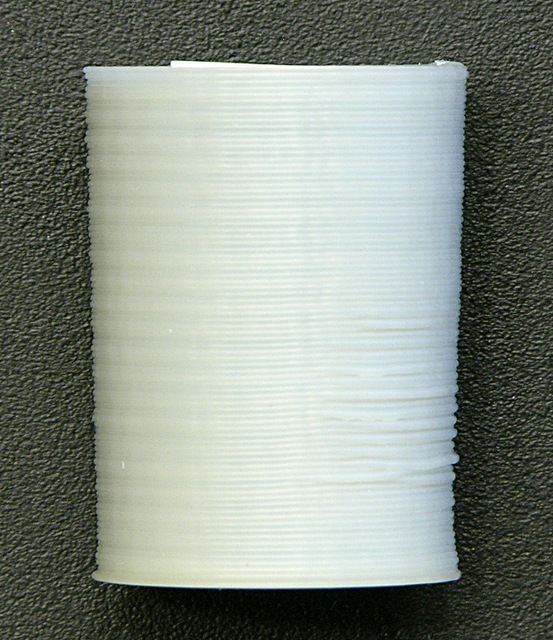 The faint ripples visible toward the left edge — about four and a half filaments high — match the thread pitch of the threaded Z-axis rods and are caused by the extruder circling through the X-Y plane as it raises during the print. This effect is well-known and is a solved problem. 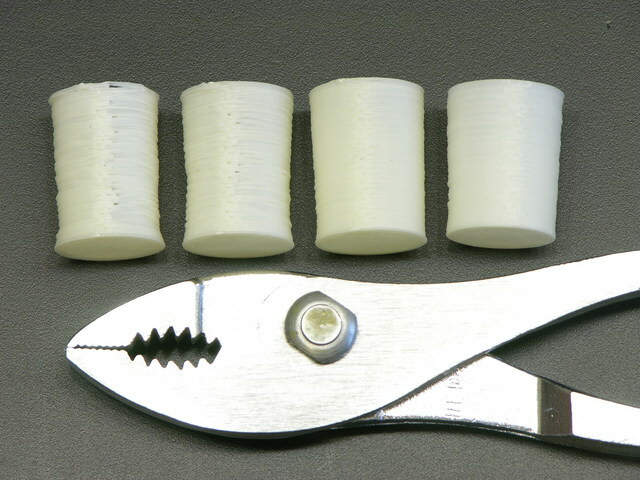 Thingiverse user “twotimes” has designed a wobble arrestor that adds rigid, smooth rods to the Z axis and new bushings attached to the extruder stage to follow them in a perfect vertical motion. It’s time! The ripple is visible at the left end of the elevation view of this fan clip (and more obvious in person than in the photograph), but it is other imperfections that catch my eye. From the front, the bottom section looks very good, but the tower at the top (which once installed is the lower part of the extruder stage clip) has considerably more variation in filament position. From the back, note the relatively high quality up to the top of the rearward extension for the clip — until which point the entire object has a single, contiguous perimeter. Above that level, the quality of the rear tower is much worse and the wall facing it is somewhat worse than below. The quality of the forward tower drops precipitously after the top of the main clip body. Some of this may be due to the smaller cross-section leaving less time for the fan to cool the filament, but I place most of the responsibility on the filament drive in my extruder. It’s still the DC gearmotor design; the geartrain has a lot of backlash; and it’s not good at fast reversals. I’m optimistic that a stepper design will control the oozing, already improving the print quality, as well as making it practical to enable Skeinforge’s Cool plugin to pause printing between layers while the fan cools the just-extruded filament. I had written about jamming my CupCake nozzle trying to extrude PLA and having to disassemble the whole nozzle to clean and rebuild it. I got new PTFE thermal barriers (the white Teflon® tube) from MakerBot, put things back together, and quickly jammed the heater with ABS, which I’d never done before. He gave me the tip to reassemble the brass heater and PTFE barrier with a drill bit of the nominal hole diameter inserted. When the two are turned together as tightly as they should be, the PTFE will begin to deform and just barely begin to grip the drill bit. Believing the filament hole through the PTFE is metric and not owning metric drill bits, I figured the next best thing would be to use filament itself (which would be slightly undersized; but I could tighten until friction increased and then back off slightly). To my surprise, I couldn’t push filament through just the PTFE tube by itself. Upon inspection, I discovered swarf where the little filament hole from the top meets the larger heater hole from the bottom, and this swarf was interfering so much with the motion of the filament that even after forcing the filament end past it, I still had difficulty moving the ABS filament through the tube. No wonder the heater was jamming! 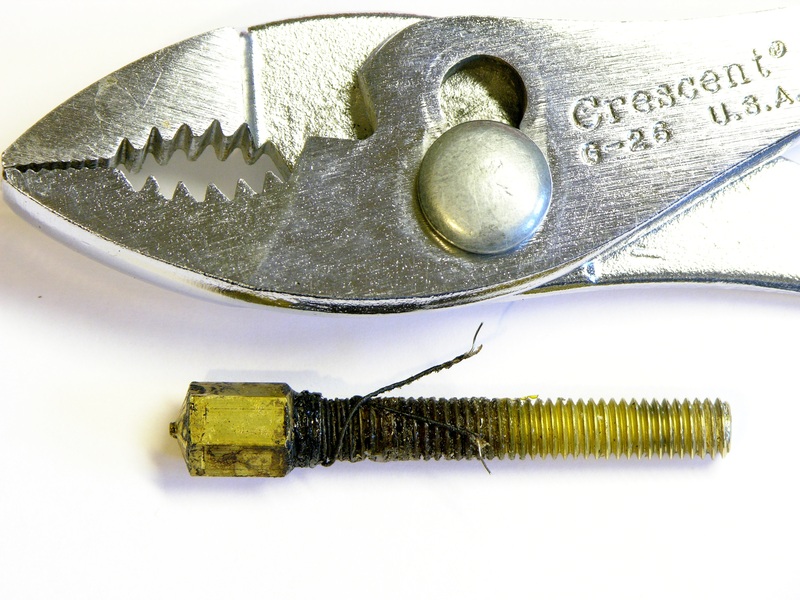 I reached into the large end of the hole with a rat-tail file and used its tip to push the swarf into the small hole, then filed it free by push-filing upwards into the hole. After cleaning the PTFE thoroughly, I reassembled the heater and fired it up again. 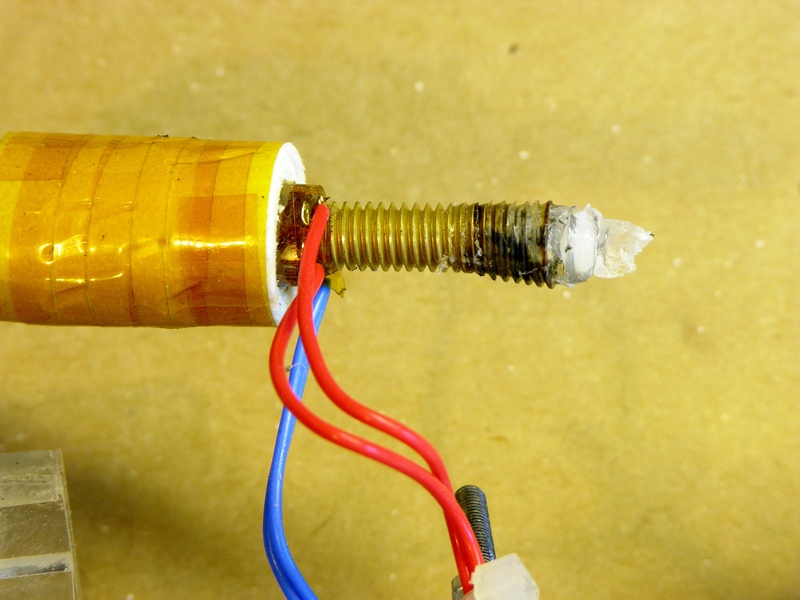 In the past, I’ve been able to hear my stock DC gearmotor slog down when the filament reaches a certain point inside the heater, and I’ve always assumed that was due to the constriction of the nozzle. Not so, as my motor no longer slogs, and instead merrily pushes filament through like chocolate sauce dribbling out of the corner of a topping pouch! I have to assume that my original PTFE barrier had the same problem (to a lesser extent) all along, and I wonder how many others out there do too. 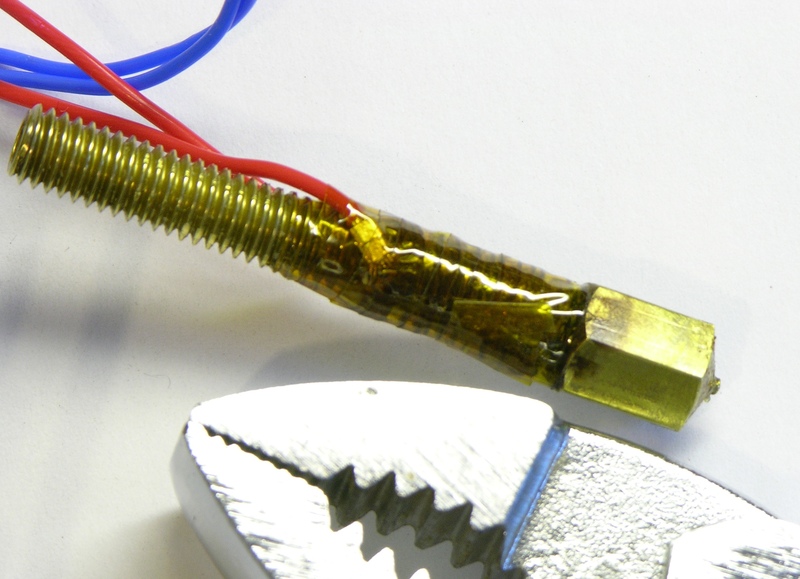 While rebuilding the heater, I initially thought that part of my original problem must have been the top of the brass getting hot enough to melt the plastic filament that close to the PTFE, as I had always pictured the filament melting somewhere inside the brass. 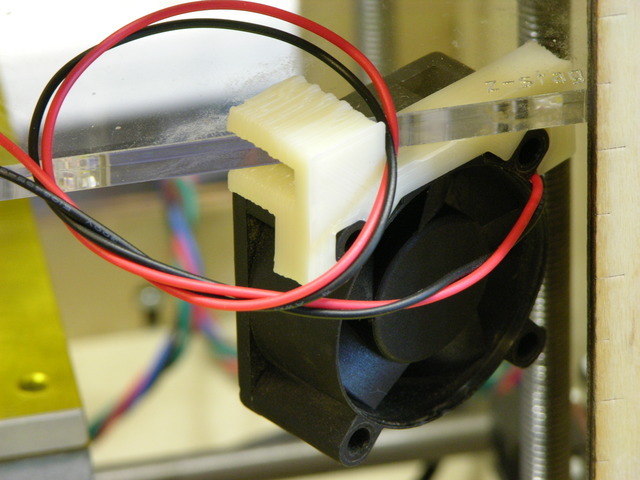 I’ve also read about hot-end designs with a heater near the tip and a heatsink higher up to keep the feed area cool and the plastic solid while inside it. I thus rewound all of the nichrome near the nozzle end and thermally insulated only the tip, thinking the cooler area above would help keep the filament from melting within the PTFE. Most of the temperature is dropped across the PTFE and the point where the plastic melts (when stationary) will be about half way between the end of the barrel and the top of the insulator. This is where it is most viscous, so it is is good that it is inside something very slippery. 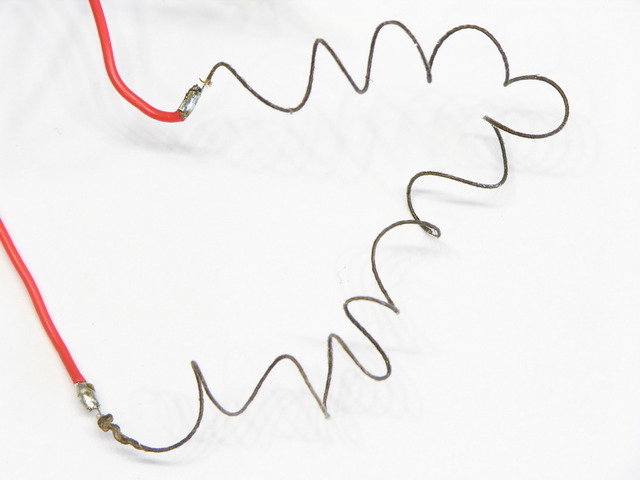 Brass is about 1000 times more thermally conductive that PTFE, but the barrel has a much smaller cross sectional area, so the thermal resistances are not as far apart as that, but still considerably different. When the filament is moving the melt point will be much closer to the top of the brass due to the time it takes to melt because ABS is also a very poor conductor of heat and has a high specific heat capacity. 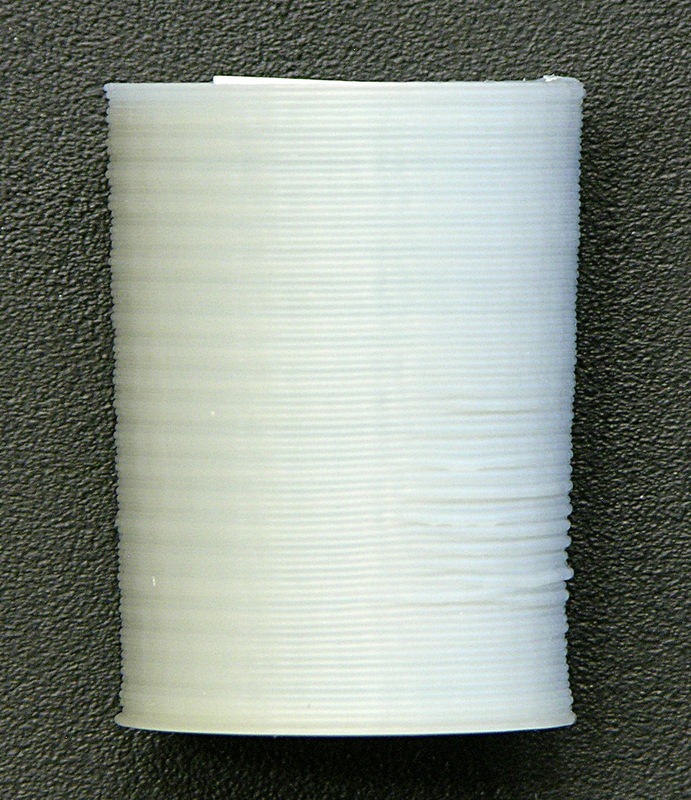 It’s a shame PTFE is not transparent, as it would be a lot more obvious when things were not working. I think when at rest the filament melts in the PTFE. When moving I think it only gets above the glass transition, so when there is a gap it expands into it and jams. Well, heck! 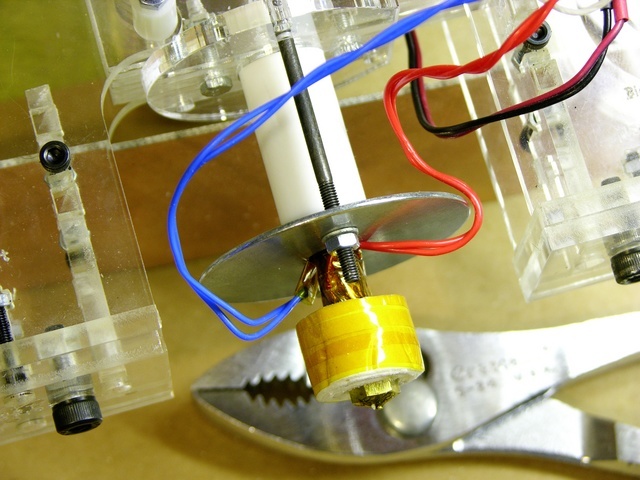 If that’s the way it works, it sounds like I want the brass heated evenly (at least in this Plastruder MK3 design) to keep the filament as soft as possible at the brass-PTFE junction. I disassembled the heater yet again, this time rewinding the nichrome as evenly along the length of the barrel as possible and once again insulating the whole barrel. After reassembling, I haven’t noticed the feed motor bogging down as it was before. I got a roll of PLA to try making some clear objects on the CupCake. 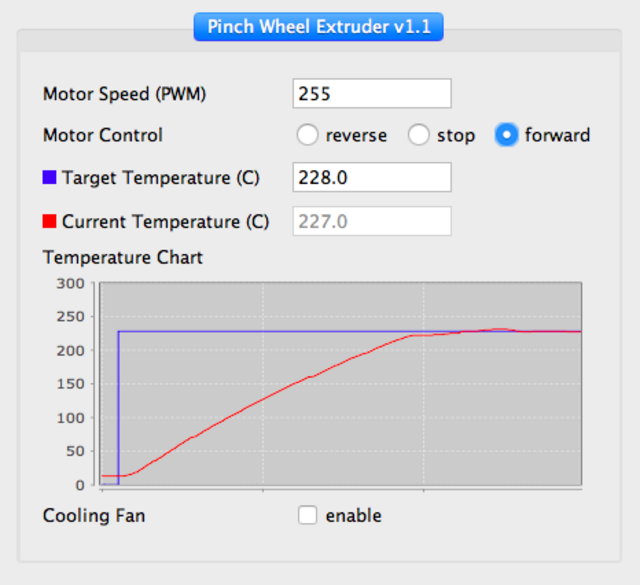 I had read on the MakerBot wiki about the techniques for and challenges of printing PLA but still had trouble feeding PLA into the Plastruder MK3 and chasing out the ABS that I’d been using. 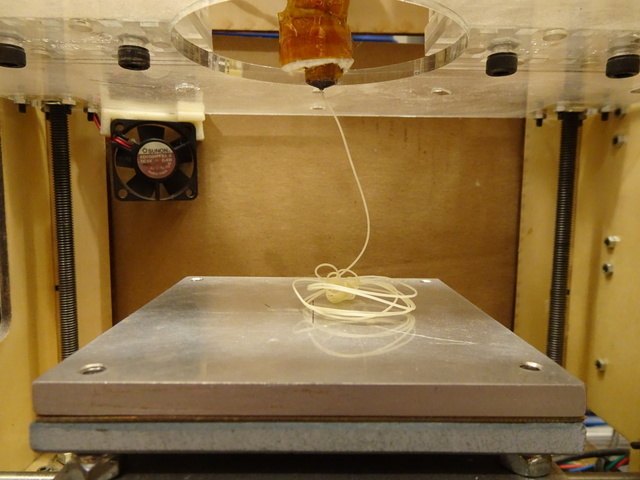 When feeding in the PLA, ABS came out for a while and then things stopped. Something happened inside the PTFE (Teflon) thermal barrier and the brass heater barrel was pushed out the bottom. Later kits have a nut between the PTFE barrier and the metal washer so the long black bolts pulling on the washer in turn pull on the nut which has a stronger grip on the threads than the PTFE, dramatically reducing the risk of the brass barrel slipping out of the PTFE barrier and dramatically increasing the risk of cracking the acrylic retainer at the top. It’s recommended to replace it with a metal retainer. Today I had time to disassemble the Plastruder and unthread the heater barrel from the PTFE barrier. Looks like the PLA melted, the PTFE got warm and softened, the PLA oozed around the heater barrel, and then the PLA solidified and the barrel was pushed out the end of the softened PTFE. 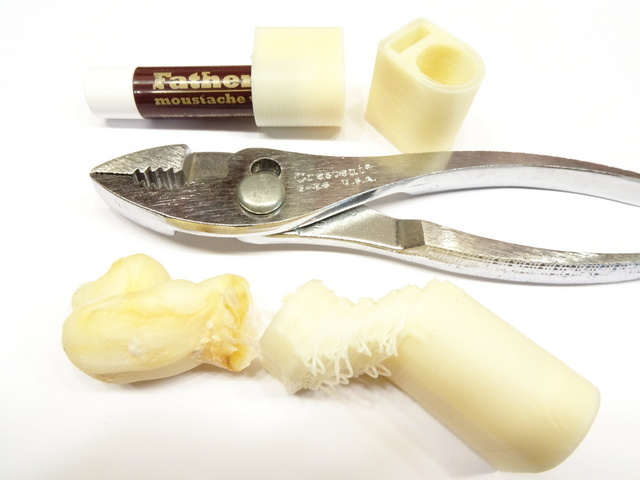 I chipped the hardened PLA off the end, then searched for a solvent that would dissolve the PLA out of the barrel. I was surprised to find no information online (I do not assert that there isn’t any but merely that I didn’t find it) and tried acetone. During the time I waited, it didn’t dissolve the PLA completely, but it did soften it enough to scrape it out of the threads with a wire brush and goop it out of the barrel with a drill bit. Since something in the thermal insulation had been previously damaged by deliberate immersion in water, I ended up deciding to peel apart the whole heater assembly. I suspect the water-soaked kapton tape adhesive closest to the nichrome heater is what scorched and I still have faith in the magical powers of kapton. I just know its weakness now. On the bright side, I get to rebuild my heater from scratch and make it beautiful again. On the dim side, I need to replace the PTFE barrier, which is swollen beyond even making contact with the brass threads, and the ceramic insulation that wrapped the heater, which was no longer pristine. I see that the MakerBot store has them in stock and affordable, and I reckon I’ll order them this week unless I hear a brilliant alternative first. The nichrome wire’s fiberglass insulation looks and feels intact — I think it’s saturated with scorch from the kapton rather than being damaged itself — but I’ll probably order more of it too. Anyone successfully using PLA, I’d love to hear what temperature works well for you and what technique you use for changing from ABS to PLA. You are currently browsing the archives for the MakerBot CupCake category.